Whether you need your last minute sugar fix, or you need to put your feet up and binge watch your favourite TV series, The Hot Choc Club subscription box makes for the sweetest accompaniment. Bringing you a selection of sweet and sugary milk flakes or dark buttons, The Hot Choc Club is perfect for warming up on a cold winter's day or treating yourself on a lazy Sunday afternoon. The Hot Choc Club enables you to indulge in new delicious, mouthwatering chocolate flavours each month, making every month that one teaspoon sweeter! Does your sweet tooth need satisfying morning, noon and night? The Biscuit Baron subscription box is perfect for any biscuit enthusiast, offering you 5-8 packets of various biscuits from all over the world which you can happily dunk in your tea, coffee or milk! If you’re bored of the standard custard and cream biscuit, then The Biscuit Baron offers a new mouthwatering adventure at home or in the workplace, along with fact sheets so you can learn where your new favourite biscuit has originated from. For those sweet shop lovers, you can now have your favourite selection of sweets and treats delivered directly to your door. The Sweet Deliveries Sweet Subscription Box offers a surprise selection of up to 10 different sweets - ranging from old classics to the new current favourites. The best bit is that Sweet Deliveries caters to all those sweet tooth fanatics with gelatin, gluten and sugar-free options as well. If you fancy a ‘throwback Thursday’ and want to indulge in a dip and dab, or you fancy your daily fix of love hearts then The Sweet Deliveries Sweet Subscription Box is ideal for you! Undecided on what sweet treat you need for your seriously large sweet tooth? Taffy Mail subscription box has the answers your dentist doesn’t want to hear, with the all-American candy takeover. Whether you fancy a cookies ‘n’ cream dipped pretzel, Reese’s Pieces or strawberry Twizzlers, this subscription box has everything you could dream of including a can of authentic American soda to wash it all down with. Taffy Mail is the perfect monthly gift for your sweet tooth. Want to have your cake and actually eat it too? Well now you can with The Cake Tasting Club’s Classic Cake Box. Indulge in a variety of homemade goodies every month, baked with locally sourced ingredients. Inside every perfectly packed delicious box of goodness you will find recipe cards to help you recreate the mouthwatering magic, along with taste notes and a complimentary tea or coffee sachet to enjoy with a cake of your choice. So get ready to put your feet up and treat yourself! 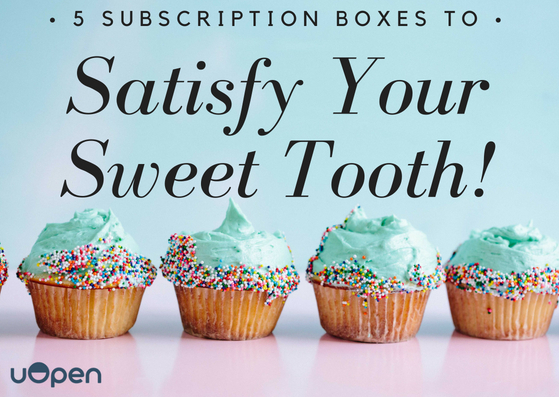 Here at uOpen, we have a delicious selection of sweet subscription boxes to get those taste buds tingling. So go on and give in to your cravings with something mouthwatering today!